A day where the weather turned terrible almost in seconds to rain and gale force winds. The horizon was totally covered in thick cloud and fog on sunrise which gave a blue hue to everything but it made the city pop out like a metal metropolis. 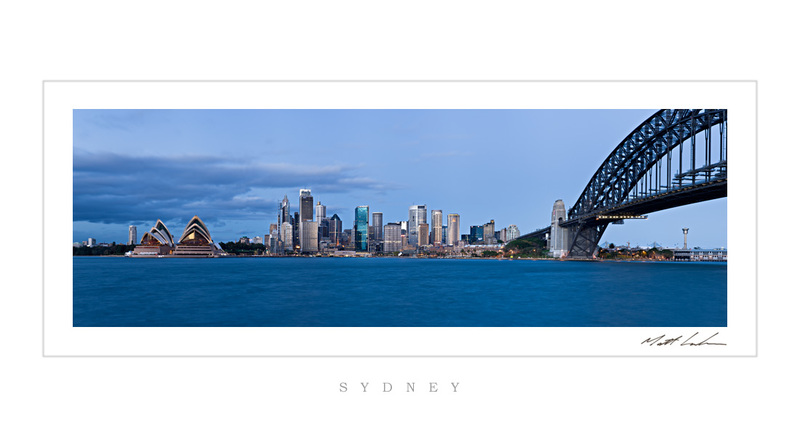 This entry was posted in Uncategorized and tagged australian capital city, Australian Stock Photography, Digital landscape photography, Panoramic landscape images, Sydney City, Sydney Harbour. Bookmark the permalink. The blue tones are super nice! I love how clouds and fog really pick up colours. I have shots from the exact same place, it’s such a lovely place to go for sunrise or sunset. Gotta try a sunrise from there when I get there in September. I have yet to leave Sydney airport but can’t wait to get some shots like this! I will however be in Sydney airport for about 3 or 4 hours on Tuesday! fantastic image Matt ! – I like the blue hues and especially the water. I see what you mean about the metal look, it looks awesome. Love the blue tones as well. The water really stands out. yes the city does pop mate, must be all the druggies popping pills! Hey I think I saw some homeless dudes! Nice shot Matty! I was flying over Sydney the other day and could see the spot where took this photo. Kinda cool for me being from Perth and all! what awonderful city it is may you give more details concerning its demography and other major economic activities carried out in this amassing city.